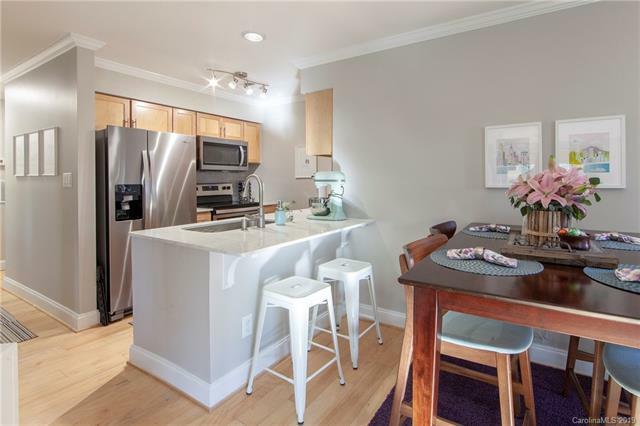 Gorgeous renovated 2 bedroom 1 bath middle unit condo in The Villages of Eastover Glen. Kitchen stands out with white Quartz countertops accented with stainless steel undermount sink and gray glass tiles. Galley style kitchen maximizes the space and opens to the dining area and living room inviting perfect for entertaining. Bathroom renovation includes new fixtures, light gray tile surround, dark gray floor tiles and is anchored by new vanity with white marble tops. Private deck is off of the living room and during the summer feels like your own private oasis. Community has hot tub, pool and community center. Offered by Costner Realty. Copyright 2019 Carolina Multiple Listing Services. All rights reserved.